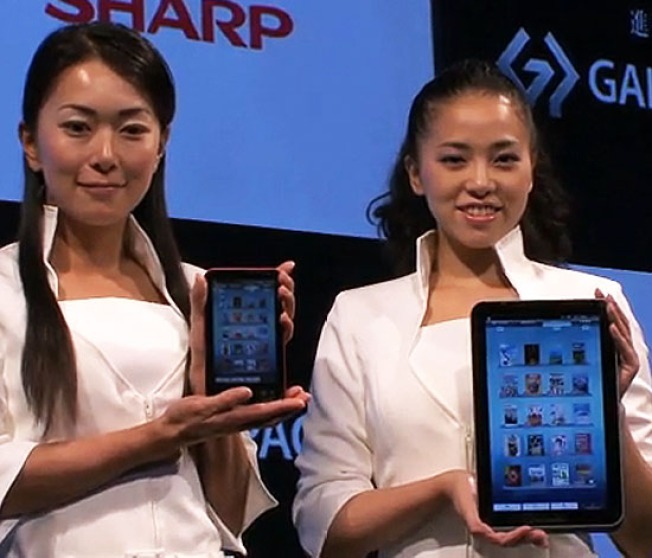 Sharp shows off its new tablet. Japanese electronics giant Sharp has unveiled its iPad competitor tablet called the Galapagos, and in the process managed to simultaneously release a copycat device and tag itself with moniker that is Japan's longest running embarrassing nickname. Using Google's Android operating system, the device will come in 5.5 inch and 10.8 inch configurations, features a trackball interface, can surf the web, and will utilize its own proprietary XMDF format for a new e-book and magazine store launching in Japan in December (one source claims Sharp hopes to launch a similar service in the U.S. with Verizon). Unfortunately, the device's name Galapagos is also often used as a euphemism to describe Japan's disconnect from the rest of the world, especially when it comes to things like mobile devices. And, although Sharp itself acknowledges the odd choice of name, their hope is that this product launch will help to change that lingering connotation. Sharp will announce the pricing for the device later this year and launch a movie and music service for it sometime next year.